Virginia Adams understands the links between spiritual health and physical health. She works as a registered nurse at First Missionary Baptist Church in Concord, North Carolina. In this capacity, she helps congregants and community members approach wellness from every angle, which includes eating healthy foods and getting exercise. 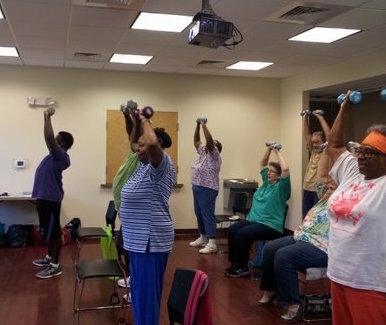 “I work with people to address the spirit, mind, and body,” she said, “and I establish a relationship with the community to help individuals see the importance of having a healthy lifestyle.” But for many church congregants and local residents, it’s hard to find affordable, safe spaces to be physically active. Concord is the county seat of Cabarrus County, which faces serious health disparities. “The county has large Hispanic and African American populations, and the adults in both groups are more likely than white adults to have a chronic disease,” said Corliss Solomon, a doctoral student in public health at UNC Charlotte. Solomon works with the local health authority, Cabarrus Health Alliance (CHA), to evaluate its Racial and Ethnic Approaches to Community Health (REACH) project. The project, funded by the Centers for Disease Control and Prevention (CDC), focuses on addressing health disparities among residents of color. CHA is using its REACH funding to increase access to healthy foods, link community projects and clinical efforts, and increase opportunities for physical activity. CHA staff and community partners met with congregations in Cabarrus County to discuss shared use: a practical, cost-efficient strategy for creating opportunities for physical activity. Cabarrus County is home to many churches, several of which already opened up their recreational facilities on an informal basis. North Carolina has been a leader in crafting creative shared use arrangements to meet community needs. As part of the CDC Community Transformation Grant program, ChangeLab Solutions partnered with the North Carolina Division of Public Health to create Congregation to Community, a fact sheet and model open use policy for congregations interested in allowing shared use. McDaniel and her partners used the fact sheet and other materials to develop a training for 7 Cabarrus County churches. After the training, every church* chose to adopt an open use policy and allow free community access to its recreational facilities without a formal partnership. Using the checklist and model policy language in Congregation to Community, each congregation developed a policy. McDaniel also worked with our team to develop a fact sheet on shared use and liability for churches in the county. Since adopting the policies, the churches have been actively promoting their physical activity classes, facilities, and equipment. First Missionary Baptist provides bilingual handouts that show possible walking routes around their grounds. One church has an improved track, and others have recreation rooms equipped with televisions and exercise videos. All the resources are open to the public.